In recent months, I have had numerous conversations and given presentations that focus on multifamily and nonresidential construction. This work includes the issue of finding workers for the trades in a tight labor market. Below are a few thoughts. All of the data is U.S. data in large part due to sample size concerns. First, I want to define what I call classic blue collar occupations. We’re talking about occupational data here, based on what tasks and duties the workers actually perform, not industry data which mixes front line workers with back office staff. Classic blue collar occupations include four occupational groups: construction, installation, maintenance and repair, production, and transportation and material moving. Reminder that production jobs are, essentially, the manufacturing jobs that do the actual manufacturing. In the job polarization research all of these occupations are routine manual jobs, and are considered middle-wage jobs. The most common issue our office hears is that it is hard to find workers. The labor market is getting tighter, due to both the strong economy and due to demographics as Baby Boomer retirements pick up. However, as I stress in these conversations and presentations, this demographic issue is widespread and impacting all industries and occupations. The trades, or the classic blue collar occupations are not facing worse demographics than other occupations. That does not mean, however, that it isn’t a problem and isn’t a challenge for businesses. The point is that the tight labor market impacts everyone. The good news, especially in places like Oregon with its migration trends, is that there are more warm bodies walking around today. The challenge is attracting them to come work for your firm. Now, one issue the classic blue collar occupations do face is that fewer young adults are working in these jobs. The relative decline is seen among young women and among young men. The key question here is how much of this is a demand side problem — fewer jobs available — and how much is a supply side problem — fewer young adults willing to enter into these professions. I do not have a perfect answer here. However the patterns and timing of the declines point toward demand side issues being the primary driver. Jobs disappear in recessions and don’t come back, or at least not all the way, in expansions. This is particularly true for production jobs. That said, I don’t believe you can entirely ignore supply issues either. The combination of fewer vocational or career technical education classes in high schools and the increased focus on attending four year universities are likely acting as supply side constraints in terms of young adults knowing about and/or considering entering into these professions. That said, I am focusing on just men — 85% of all blue collar workers today — in this final set of charts due to sample size concerns as I dig into the microdata. 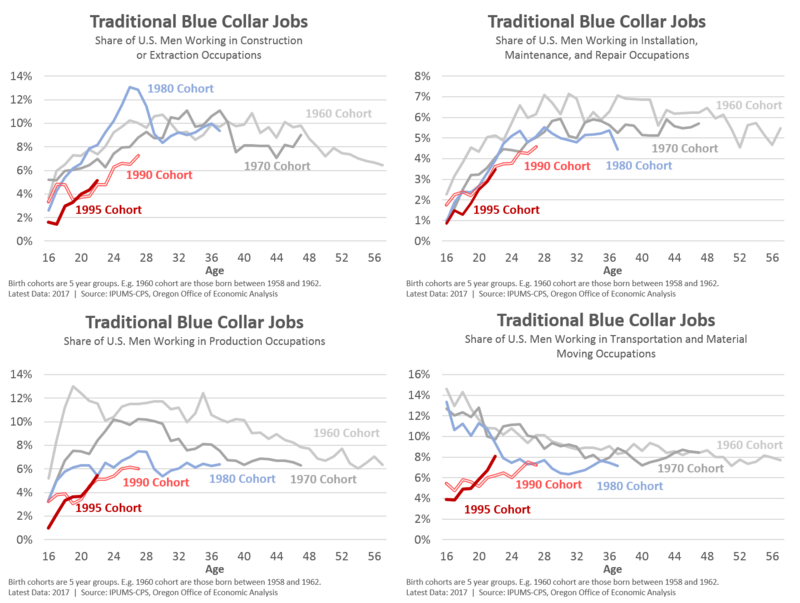 These charts show the share of men employed in each blue collar occupational group over their lifetime by birth cohort. So as you follow one line left to right, it tracks that birth cohort as they age into their 20s, their 30s, their 40s, and their 50s. Each separate line represents a different birth cohort. This allows you to see both lifecycle and generational effects or trends. First, there has been a relative decline in employment across all blue collar occupations, but to somewhat varying degrees. The decline is particularly large for production jobs, seen in the lower left. There really are fewer production (manufacturing) jobs today, and you can see the decline over time among the younger and older cohorts. Second, the Great Recession clearly impacts the 1990 cohort to a significant degree. There really were fewer job opportunities for this group when they entered into adulthood and even after college. This is particularly pronounced in construction jobs, seen in the upper left. There was no erosion among young men entering the field for the 1960, 1970, or 1980 cohorts. However in the aftermath of the housing bubble, there certainly was. Encouragingly, as the jobs have come back to the industry, so too have young workers. The employment share is rising quickly for both the 1990 and 1995 cohorts. Third, there is considerably less erosion among installation, maintenance, and repair workers over time. In fact, recent cohorts are just a hair below previous generations. This is good news, because these jobs, along with construction (particularly the nonresidential) are the gold standard for career paths that do not require a four year degree. Both of these occupational groups are largely population driven and less prone to automation or offshoring. They are growing middle-wage career opportunities. Fourth, the gap in transportation jobs for young workers is largely about laborers and packers. However the surge in employment among the 1995 cohort is closing that gap quickly, as it is largely contained to these specific occupations. I suspect, but cannot confirm, that these would e-commerce related jobs which have increased considerably in recent years. Still, there is a 1-2 percentage point gap when it comes to generational differences for truck drivers. This amounts to about 30,000 potential truck drivers at every single individual age. Of course, as has been documented plenty, truck driving is a grueling profession with long hours on the road, and, you know, the supposed pending doom of automation is looming. Bottom Line: All industries and occupations are being impacted by the tight labor market and Baby Boomer retirements. 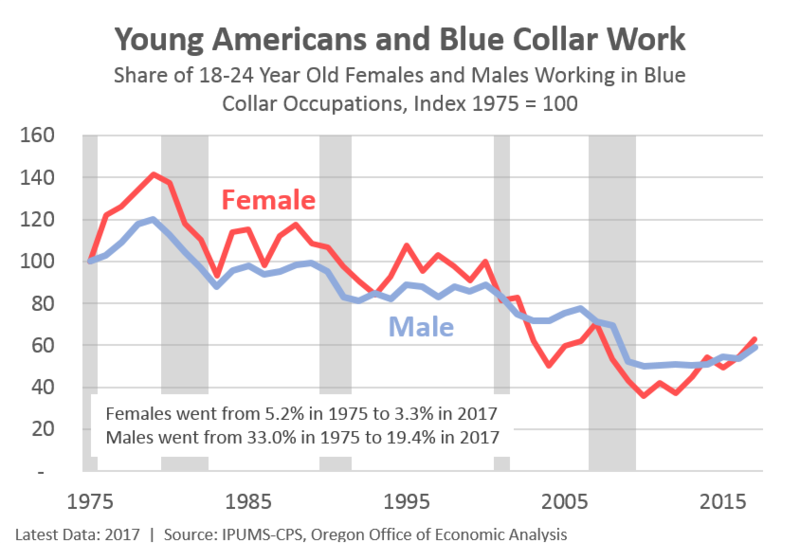 However classic blue collar occupations really are seeing fewer young adults enter into their professions. This largely appears to be due to the fact that there have been fewer such jobs in recent decades. However we cannot entirely ignore supply issues, nor pools of untapped potential workers, like women. 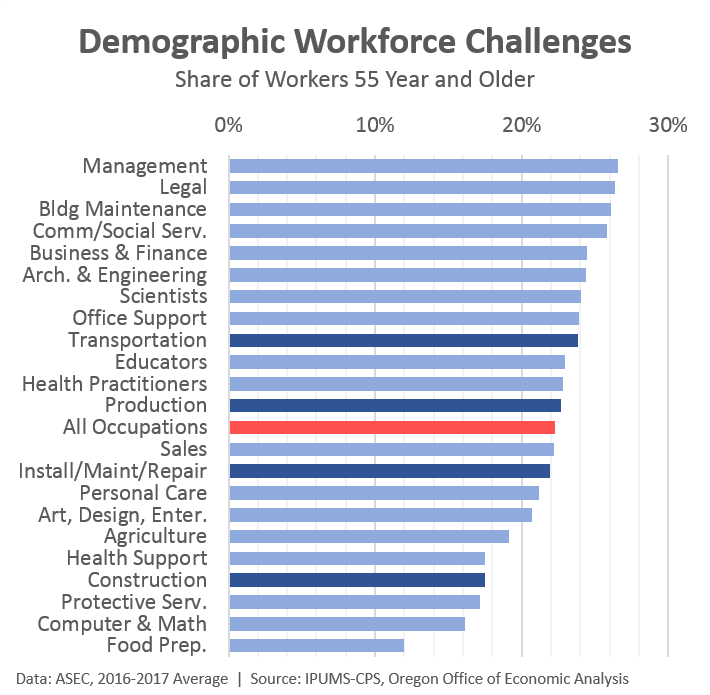 In a yet unwritten future post I want to highlight some of the programs in place in Oregon that work on career technical education and apprenticeships. Looking forward, I am optimistic about more young adults entering into the trades, particularly in the better-paying construction and installation, maintenance, and repair jobs which cannot be offshored nor as easily automated away. These remain growing fields of work. Good article and I look forward to your observations on technical education as it also strikes me that we have a significant need for more such programs in order to achieve a better balance between technical and university educated workers. I think it is also worth considering how we can better keep technical workers attached to the work force during a recession. As we have seen in past housing boom/bust cycles, when a recovery begins, too few workers are available. Unemployment benefits can help ensure that workers will be available when a recovery begins, but limits on the dollar amount and term of such benefits are often not enough to prevent workers from looking for other jobs. I get that many would object to increased unemployment benefits, but there is a real opportunity cost in not having enough workers available when a recovery begins. Thanks Scott. I, too, look forward to the upcoming work. I was able to co-present on this stuff with Steve Simms at BOLI who oversees the apprenticeships. He had great information and insights I hope to borrow and share here as well. To your broader point, I think there is clear value in some sort of work sharing arrangements, like in Germany, in terms of keep individuals attached to the labor force, and more importantly attached to employment.